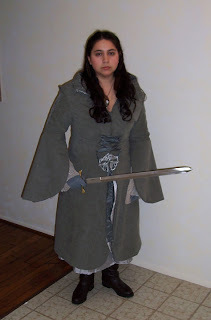 This is the first Lord of the Rings costume I made. I redid parts of it after seeing the real one on exhibit. 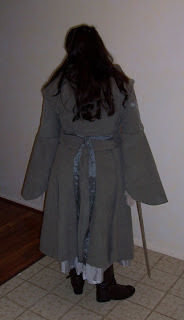 It was made out of a greenish gray suede fabric that I found on ebay. The collar decoration was done by hand with puffy fabric paint, and the princess seams are over stitched with a baseball stitch, like the real costume. My costume zips up the front with an invisible zipper and is laced with a gray china silk sash that threads through the sculpey buckle that I made to match the real one. The undersleeves are made from metallic crinkle silk organza, and a very close match to the real costume. 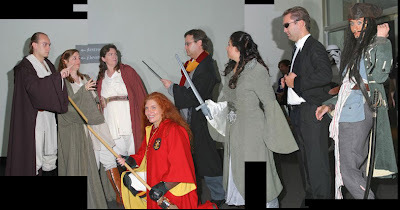 My friends and I did a skit for Balticon called "Lord of the Box" office, which went over really well. We added to it, and then did it at the DragonCon 2003 masquerade. We won audience favorite! Here's a picture and a video.